Sunday, July 26 1908 -- Hunting and fishing are shown to be good in Southern California this summer. I had no idea that hanging a fish above your food would discourage yellowjackets. Chances of me putting this newfound knowledge to use -- slim. Actually, you hang the trout away from your food (and downwind), so it will attract the yellow jackets. Worked very well when I was a kid. Ah! Good thing you explained that to me, as my trout was totally misplaced. I was wearing it around my neck to ward off those darn yellowjackets. Never had so many wasp bites. Connie, January 31 1937, courtesy of Cole Johnson. Arthur D. “Art” Beeman was born in Los Angeles County, on January 8, 1914, according to the California Birth Index, 1905-1995 at Ancestry.com. In the 1920 U.S. Federal Census, Beeman was the youngest of two children born to Fredrick and Louise. They lived in Florence, San Antonio Township, Los Angeles County, California at 1407 Woodside Avenue. His parents emigrated from Hannover, Germany in 1884, and his father was a factory contractor. The 1930 census found the family in the same city but at a different address, 1311 East 83 Street. His mother, a widow, was the head of the household. The fate of his father is not known. Information on Beeman’s education and art training has not been found. His sports cartoon was published in the San Diego Union (California), July 30, 1933. The Beemans remained at the same address in the 1940 census. He was a newspaper cartoonist. It is not known if he served during World War II. Who’s Who of American Comic Books 1928–1999 said he produced material for comic books in the early 1940s, and assisted on Seein’ Stars from 1940 to 1951. His comic book credits are at the Grand Comics Database. The New Salem Journal (North Dakota) published his strip, Those Were the Days; selected strips: March 2, 1955; May 4, 1955; July 13, 1955; and December 14, 1955. Beeman found employment at the Jet Propulsion Laboratory. The Star-News (Pasadena, California), May 9, 1958, published his comments about the American space program. “The satellites already shot aloft are fingers reaching for knowledge of the unknown,” Arthur D. Beeman, art director for Caltech’s Jet Propulsion technical publications and former aircraft designer, emphasized yesterday before Council of Woman’s Club…. …Titling his talk “Spotlighting the Future in Transportation,” Mr. Beeman spoke of the new age of outer space flight which lies ahead. He predicted, “Within 2 or 3 years a man will be put in orbit and be safely returned to the earth.” He also opined that a manned outer-space platform will be in operation within 5 years. He contributed art to Mars Revisited (1959) by Donald L. Cyr, and Mariner Mission to Venus (1963). Beeman passed away April 14, 1999, in Altadena, California, according to the Social Security Death Index. His portrait of William Pickering was used on the cover of William H. Pickering: America’s Deep Space Pioneer (2008). One of the things about our world that makes me despair is that most of us lack even the most basic knowledge of history. No, wait, that's not quite it. I have pretty much come to terms with the idea that many people don't know who was president during the American Civil War, or when the Great Depression occurred. What actually bothers me is not outright ignorance, I guess. It is the fantasyland people have built around the past. Witness Art Beeman's Those Were The Days, which affords a perfect example. 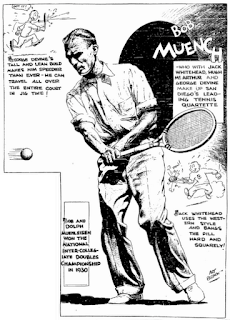 This genre of feature, in which the cartoonist paints an idealized portrait of the past, has been popular since the dawn of newspaper cartooning. Many of us idealize the past, forgetting all the ills of those times, and repainting them in gay Disney-bright colors. Everything was better then, and if only this horrid modern world would stop moving forward, everything would be just great. This attitude goes well beyond nostalgia, which I suppose is pretty harmless, to an absolute rejection of the world as it is, in favor of one that supposedly, but didn't, exist in the past. The past was not some idyllic time when everyone was nice to each other and everything cost a nickel. There were the same murders, kidnappings, rapes, and every other vice known today. For every decade you go back, sicknesses become more and more deadly, and it's not too long you have to go before simply being born becomes a crapshoot. Government was not once full of earnest Jimmy Stewarts; it was corrupt in many truly spectacular ways that make today's politicos seem downright angelic. Rapacious businesspeople ran roughshod over workers and ruined the environment with impunity. Minorities were treated with all the courtesy of lepers when they weren't being taken advantage of, or, if we go back far enough, enslaved outright. Every generation longs for the world of its youth. Life and the world seemed so simple then. Well, of course it did, for crying out loud! You were a child. You didn't worry about keeping your job, you weren't wondering if that weird pain that won't go away is cancer, you didn't sit in traffic for two hours a day, and you didn't have a honey-do list a mile long waiting for you when you got home. You can bet your prized mint-in-box Flash Gordon raygun that people who had rotten childhoods don't feel much love for the 'good old days'. Being smacked around at home as a kid, or worse yet, not having a home at all, is a sure way to avoid the pitfall of revering the "good old days." Okay. Got that off my chest. On to business. 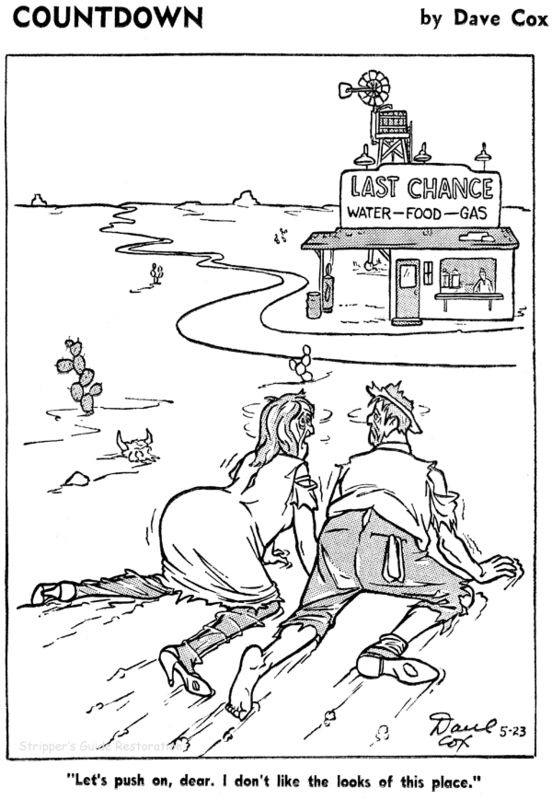 Those Were the Days was by Art Beeman, the only comic strip credit by him of which I'm aware. 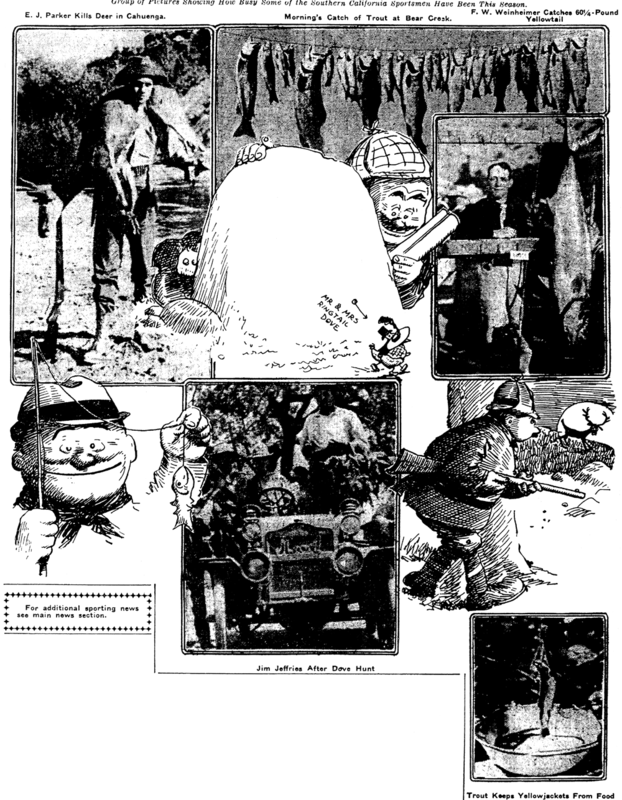 The strip was produced for Al "Mutt and Jeff" Smith's weekly syndicate service. It debuted in 1951, almost certainly as one of the original line-up of strips and panels for the new service. (I still haven't been able to pin down an exact starting date for the service -- anyone?). 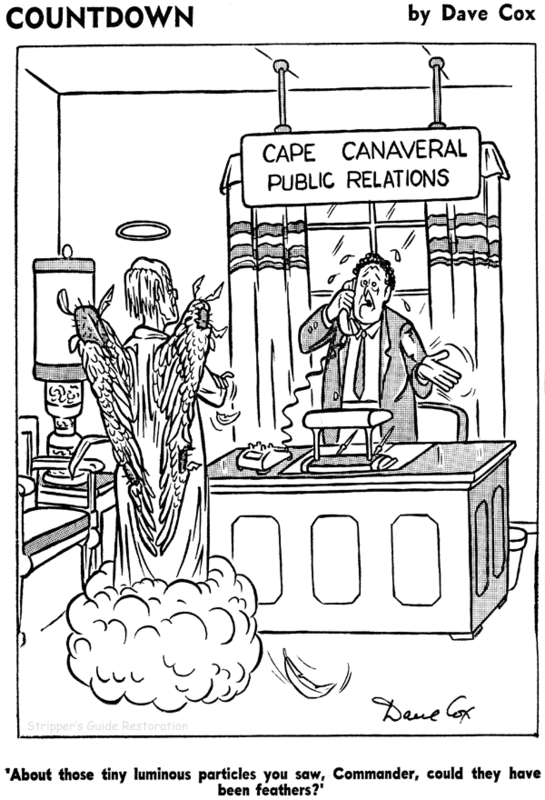 As with most of the Al Smith Service features, Beeman's strip probably went into reprints at some point, but the strip was included in the service's offerings until 1983, an impressive 32 year run. I just don't know how much of that 32 years was new material, and how much recycled. 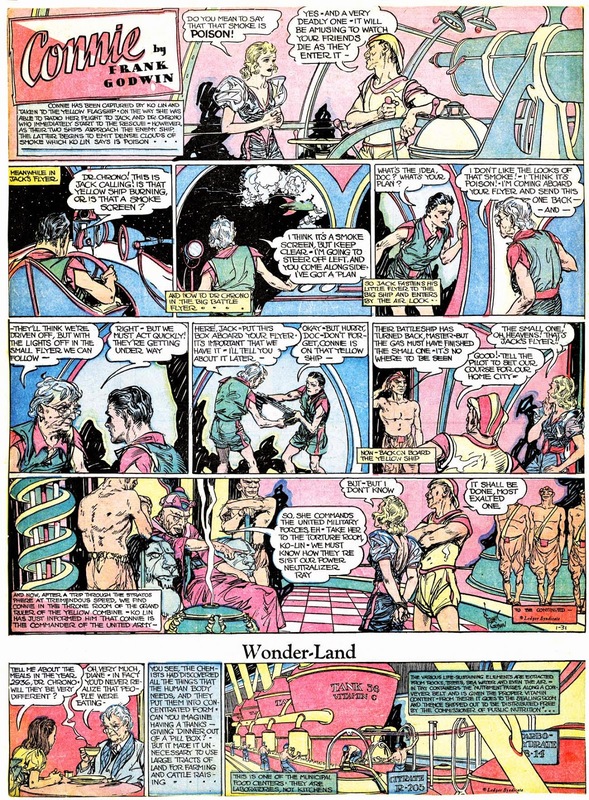 The strip was consistent not only in content but in format -- each strip began with a superfluous title panel, ignoring that the strip was titled in a headline above, and a middle panel with the caption "But now -- Wow!" This reminds me of the old line, "The great thing about living in the past is that you can't be evicted." Nice rant. Totally agree, although you'll have to to admit, "those days are gone forever". The 1870 U.S. Federal Census recorded Hugg, his wife, Ella, and son, Willie, in District 12, Allegheny County, Maryland; their post office was located in Cumberland. Arthur Y. Hambleton, 319 North Paca street, Alice B. Sisselberger. In the 1900 census, Hambleton and wife, were in the household of his mother-in-law, Mary Sisselberger, a widow. They lived in Baltimore at 1506 Mount Royal Avenue. Hambleton’s occupation was artist. Addresses for Hambleton were also found in the R.L. Polk & Co.’s Baltimore City Directory for 1901: Hambleton Arthur Y, artist, 1506 w Mt. Royal av; 1903: Hambleton Arthur Y, artist, Woodland av c Reisterstown rd; and 1904 Hambleton Arthur Y, artist, 607 Lennox. 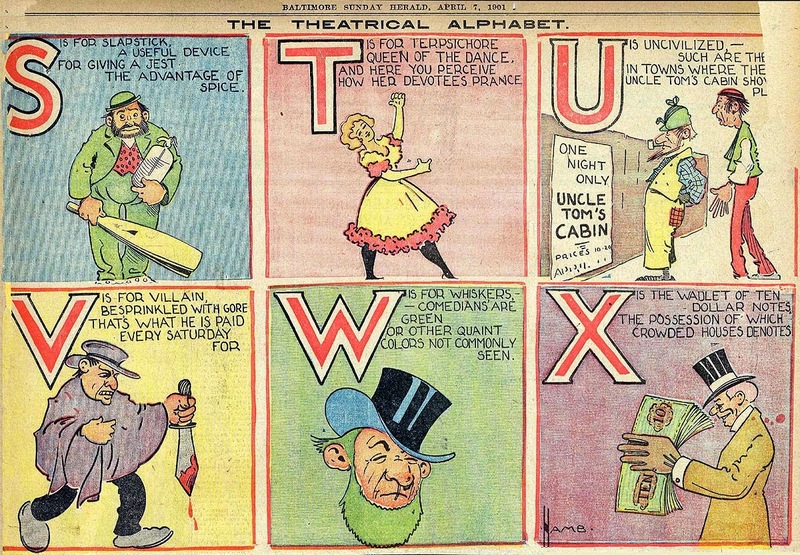 One of Hambleton’s early works, The Theatrical Alphabet, appeared in the Baltimore Herald. He illustrated the poetry, which was written by H.L. 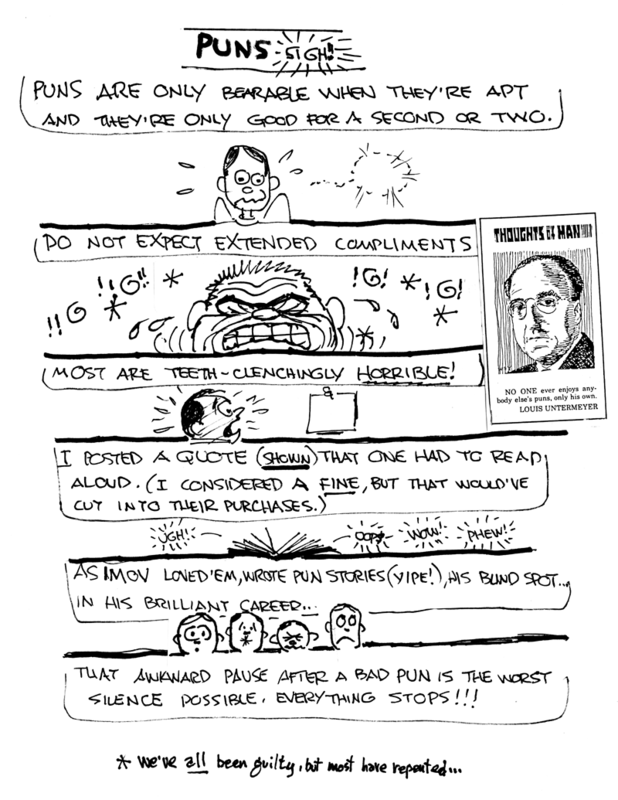 Mencken, and the signed his name “Hamb”. The five-part series ran in early 1901. 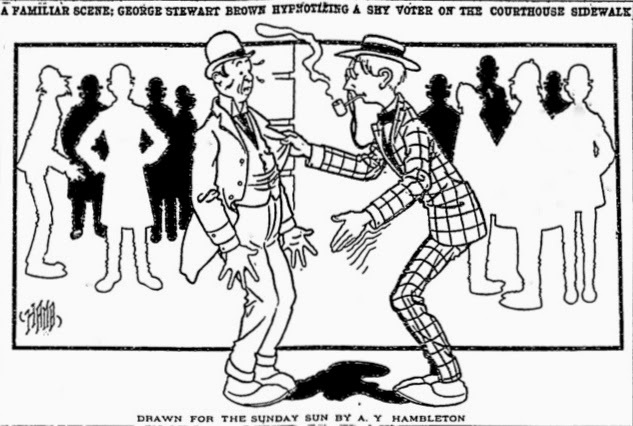 Hambleton’s work was included in a number of exhibitions including the Charcoal Club (The Sun, March 10, 1905); the Newspaper Artists Association and the Book and Magazine Illustrators’ Society exhibition (The Sun, May 2, 1906); and the Journalists’ Club Show (The Sun, February 26, 1909). 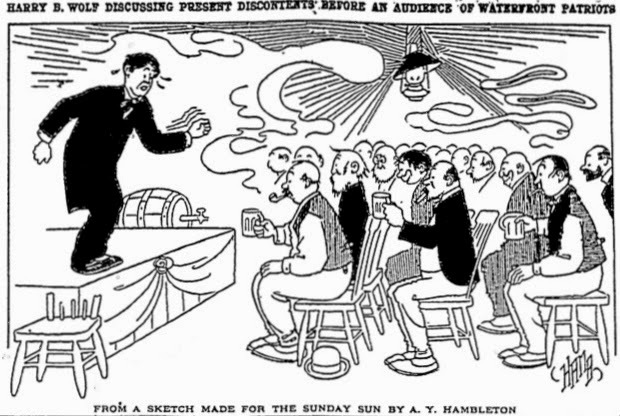 Hambleton contributed cartoons to the Sunday Sun in 1906 and signed them “Hamb.” His Sunday strip, Waldo and His Papa, ran in the Washington Times (District of Columbia) in 1906 on these dates: July 8, July 15, July 22, July 29, August 5, August 12, August 19, and August 26. In 1910, artist Hambleton was the head of the household which included son, Richard Waldo, born 1901. The family of three lived in Baltimore on Pimlico Road. Hambleton signed his World War I draft card on September 12, 1918. He lived at 2710 Reisterstown Road in Baltimore and was a newspaper artist for the International Syndicate. His description was tall, slender, with gray eyes and brown hair. In the next census, Hambleton remained in Baltimore at another address, 2710 Fanview Avenue. He had his own business as an artist. According to the 1924 Baltimore city directory, he lived at 2710 Reisterstown Road. Advertising Arts & Crafts (1927) had his business address: Hambleton, A. Y. Studio, 13 W. Mulbury, Ven 6065 Baltimore, Md. The 1929 Baltimore city directory listed his studio at 122–24 West Franklin and his residence at 3110 Reisterstown Road. The 1930 census said Baltimore remained Hambleton’s hometown where he lived with his wife and mother at 3110 Reisterstown Road. He was a newspaper artist. The listing in the 1936 Baltimore city directory said his address was unchanged and he was an instructor at the Maryland Institute. At some point after 1935, Hambleton moved to Severna Park, Maryland. He continued teaching at the Maryland Institute. The record shows that he completed the seventh grade. His home was valued at $4,500. In 1939 he worked 40 weeks and earned $1,500. The Sun, November 14, 1949, reported the Hambleton’s fiftieth wedding anniversary. In addition to being a commercial artist, he had conducted guitar and ukulele lessons, for ten years, beginning around 1915. Hambleton.—On July 3, 1957, at his home, Luna lane, Round Bay, Arthur Y., beloved husband of Beatrice S. Hambleton (nee Sisselberger) and father of Mr. Waldo Hambleton. Funeral services will be held at Wm. J. Tickner & Sons, North and Pennsylvania avenues. Due notice of services will be given. He was buried at Mount Olivet Cemetery in Baltimore. Countdown is a really interesting panel. 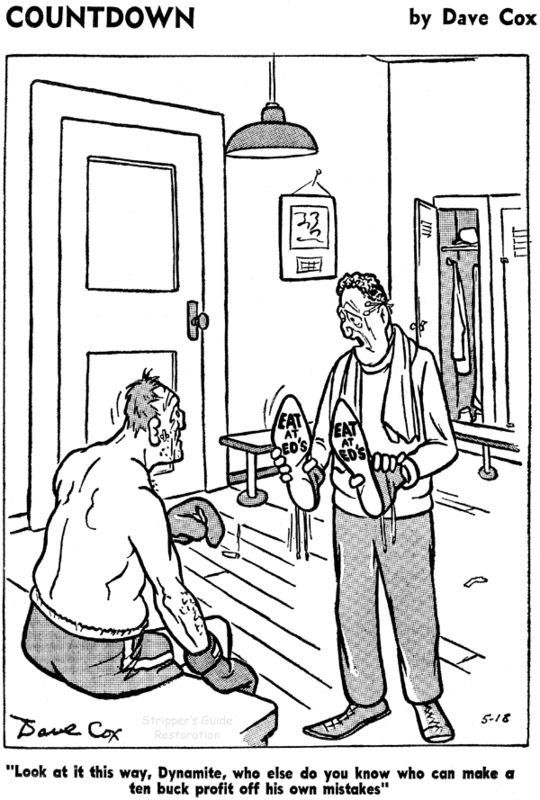 If you are into gag cartoons, the moment you look at an example of the series you know that it must be the work of master gag cartoonist George Price. Price's cartoons are quite distinctive, so there seems like no room for mistake. However, when you let you eye wander down to the signature, some guy named Dave Cox has signed it! As perfectly as the style (and even the subjects!) seem to fit Price, I wondered if Price was using a pseudonym to produce a daily panel series. But that doesn't make a lot of sense. Price was not on contract to anyone that I know of, so there seems like there'd be no reason for him to hide behind a pen-name. I might still be scratching my head over this one if I hadn't stumbled across two additional series by Mr. Cox, ones that he self-syndicated back in the late 1940s. In those series the George Price style is much less accomplished. Cox had yet to earn his chops as a doppelganger for that master cartoonist, and although he is definitely going for a George Price look, the effect is far less convincing. Countdown was self-syndicated to a few newspapers (mostly or maybe all in California) starting May 16 1962. The latest I've found the panel still running is in early 1963, but I don't have anything like a certain end date. PS: Oh, by the way. If you're confused by that second panel above, you young whippersnapper, you can watch this (overly dramatic) video relating John Glenn's odd encounter in space. Would making a repeat offender read a book of puns be the appropriate PUNishment? I actually like well done puns. You know, when they are truly punny.